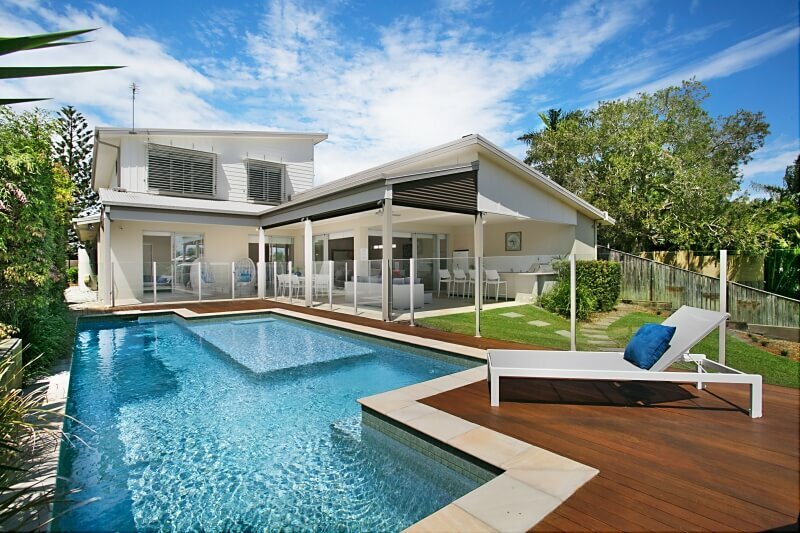 Elite Holiday Homes has over 45 luxury properties in the heart of the Gold Coast that offer a luxury trip in the midst of an array of services and facilities. With 45 opportunities for the perfect holiday, how can you choose the right holiday house? Each month we will be featuring an Elite Holiday Home for our ‘The Home Spotlight’ to help you plan your next trip. The House: Sunset on Sheridan is the perfect home for chilling out and overlooking the waterfront while the kids play and your pizza cooks in your own pizza oven. This luxurious home gives you the best of both worlds with spacious living areas inside and fantastic outdoor entertaining outside both overlooking the waterfront. It has a full outdoor kitchen and is a very family friendly home. The Location: This home is in a tranquil location yet close to restaurants, shops, casino and the convention centre and only a 25 minute drive to the Theme Parks for the kids. The Living: Sunset on Sheridan has generous open plan indoor/outdoor which makes the most of the wonderful Gold Coast lifestyle. It has 6 bedrooms and 3 bathrooms. There is a Rumpus room with Playstation, DVD, Foxtel, Ipod Docking Station and free internet. The home is fully air conditioned for your comfort and has a two car garage. The swimming pool is ideal for families with a larger beach area for smaller children. The Outdoor Entertaining: The designer kitchen is well equipped with quality Miele appliances and includes a Nespresso coffee machine. The outdoor entertaining is superb with virtually a full living area outside including a complete outdoor kitchen. It is designed to make the most of the waterfront living with large covered outdoor areas along with plenty of space to also enjoy the sun. The large grassed area is great for kids and it has a playground to keep them amused. The Bedrooms: The master suite has an ensuite and there are three bedrooms upstairs and three downstairs. There is a bathroom on both levels. The bedrooms all have King beds.